50 years ago, the most influential book on modern American writing hit the shelves. 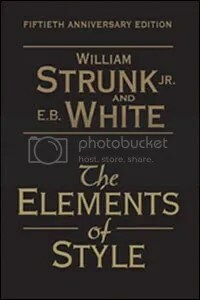 Strunk and White’s Elements of Style still follows its own oft-quoted maxim “omit needless words”: the book still weighs in at the publisher’s holy number of 128 pages. (The more comprehensive Chicago Manual of Style runs to near 1,000 in tiny type.) I loved hearing on the news this morning that the publisher got a telegram from Berkeley, CA during the first printing asking “send more copies. Whole campus gone mad.” If you’ve ever studied writing at the college level, you’ve probably read the book; if not, all your teachers were certainly influenced by such advice as “Vigorous writing is concise. A sentence should contain no unnecessary words, a paragraph no unnecessary sentences, for the same reason that a drawing should have no unnecessary lines and a machine no unnecessary parts.” If you’ve never done so before, please take a look; the advice is well worth your time.